Sarah Curry was born and raised in Cleveland. She received her B.F.A. from Kansas City Art Institute with a major in Illustration. Soon after graduating, she returned to Cleveland and is currently living in Cleveland Heights. 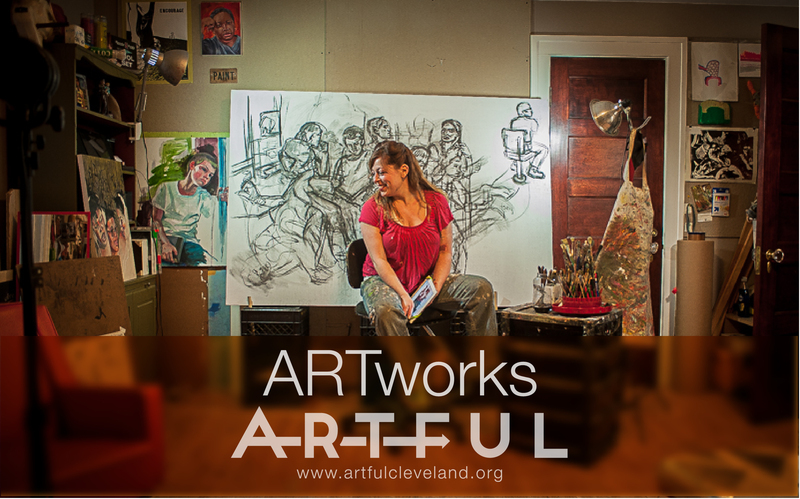 Her love of teaching both children and adults at The Cleveland Museum of Art inspired her to attain her Master’s degree in Art Education from Case Western Reserve University. She has since been teaching art to high school students for sixteen years. 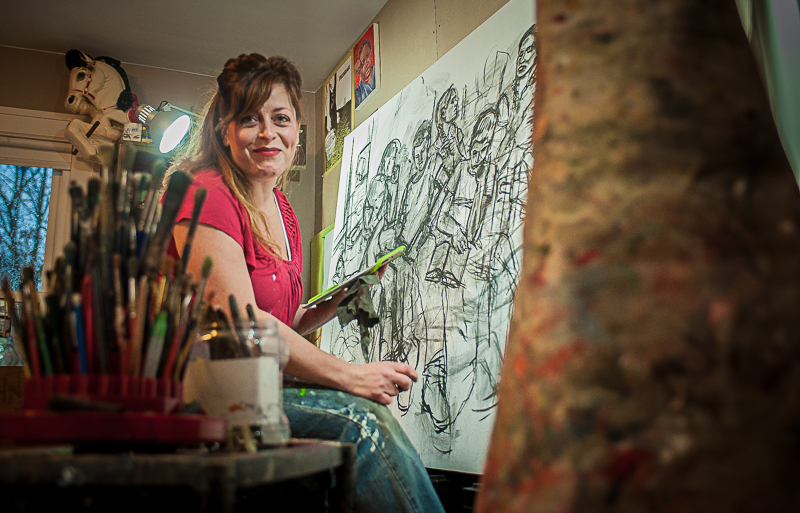 Sarah works in a wide variety of styles ranging from realism to abstraction. 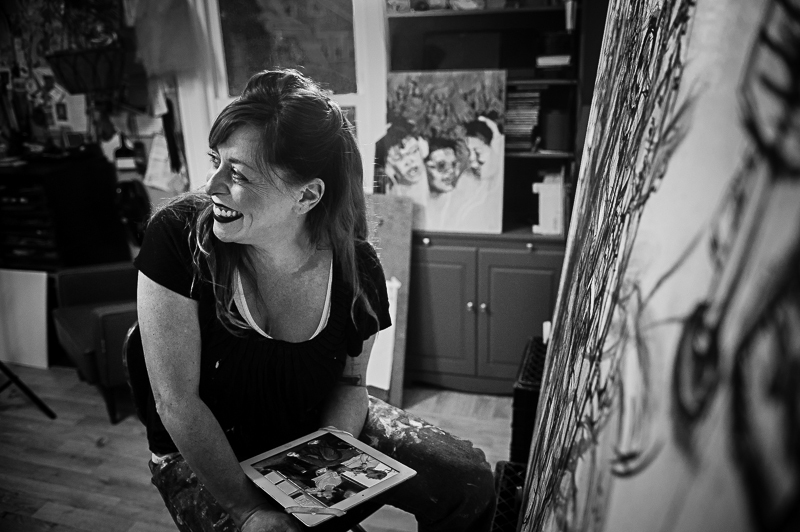 Among many endeavors, she has established herself as a portrait artist as well as a freelance illustrator and muralist. 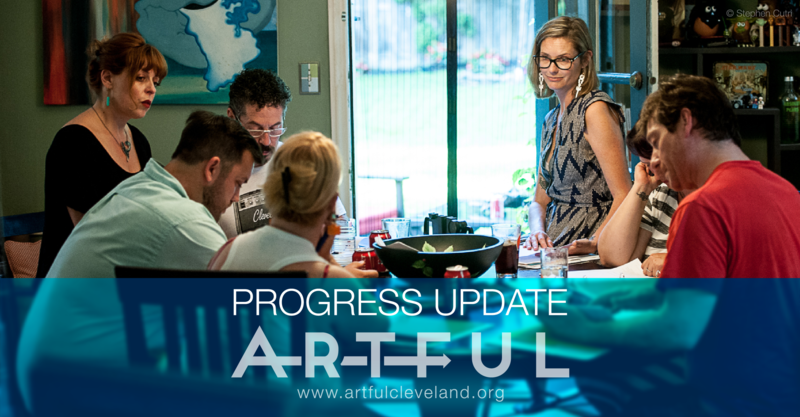 She has spearheaded several public art installations in the Cleveland area collaborating with local artists, students and community members. Her personal work narrative revolves around storytelling that addresses women’s roles in society. This series of work revisits old stories and reinterprets the themes,imagery, and lessons through the contemporary eyes of friends and family. Each piece refers to a story from the past and is also biographical to the subjects depicted. 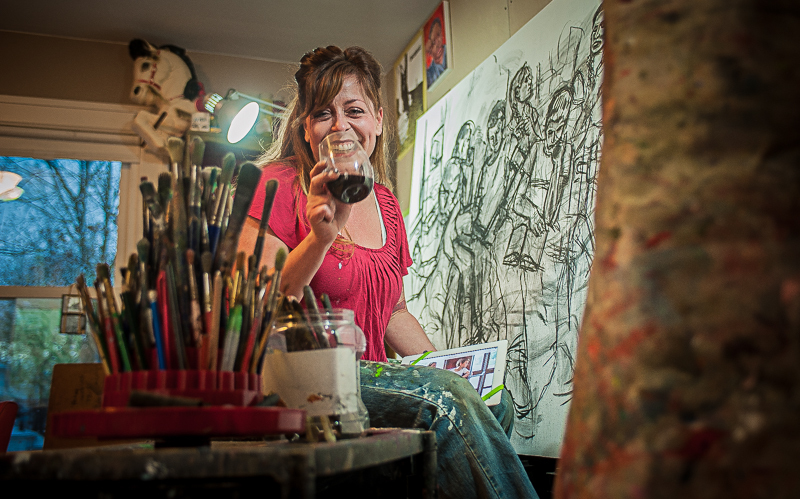 She sees these works to be collaborative storytelling. Her most recent work will be on display this summer: “Face Value” Opening July 15th from 5-9pm at The HEDGE Gallery, 1300 W 78th Street, suite 200, Cleveland, Ohio 44102. Her work can also be seen on her website: www.pinchofcurry.com. Do I have to choose just one?! Maybe it’s the fact that I can throw paint around and destroy the floor with no apologizes! And the homasote walls that allow me to tack up images and work directly on the walls. The view is pretty awesome as well. Its on the second floor of my house with tall windows that allow me to see the yard and the cats running around outside. I think your studio must be a place for all of the above. Devoting your time to working in your studio is imperative so it must feel like a second home. We can all get down to business, find inspiration and relax in our homes so the studio must be an extension of your house. Filthy, but organized, crowded but plenty of room to make more messes. art makes you a stronger artist because you learn how to break down information it its simplest language. This forces you to investigate your own practices and hone your approach to art making. All my processes begin with an idea. The idea will usually tell me where it wants to go or at least hint at the media I need to use. If not, I have to coax the idea out with sketches before it dies on the vine. Sometimes that’s OK as well. Maybe it didn’t need to come to fruition, maybe it will lead me to another place eventually. Working on art is never a waste of time. Even if you make crappy work, it’s important to put in the time and pay your dues because there is ALWAYS a pay off. I am honestly most inspired by the people in my life. I’m a pretty social creature and surround myself with amazing people. I love to listen to stories and explore imagery inspired by the stories and those telling them. When I saw Saul Williams speak a few months back I wept through his spoken word poetry because I knew I would never be able to paint anything as beautiful as the images he described. Traveling and going to countless galleries and museums also play a big role in my work. Seeing the work of both young artists as well as the old masters keeps my “well” full so I can dip in for some fresh water when I need it. Make mistakes! Make as many as you can by experimenting and stepping outside of your comfort zone. Play with new, unfamiliar materials and techniques because that’s when the leaning happens. If it comes easy, you don’t learn as much. When you destroy things or make mistakes, you remember that experience much more. Living in Cleveland Heights is pretty dreamy. Not just for artists but for all open-minded people. We all love seeing art everywhere. I don’t know anyone adverse to art. The best way to support the arts is to BUY ART!!! It’s an addiction but it is never an expendable cost. Living with art pays off everyday, both spiritually and emotionally. Who cares if the artist is well known, do you love it? Then buy it. You wont regret it. I am fortunate enough to be represented by Hilary Gent of HEDGE Gallery in the W. 78th Street Studios so she personally supports me by doing the legwork involved in displaying, selling and promoting my work. Previous Previous post: The artists are coming… THE ARTISTS ARE COMING! !